HACKENBERG, Eva (2017) Game Jam der Bibliothek des Goethe-Instituts Marokko in Casablanca. Paper presented at: IFLA WLIC 2017 – Wrocław, Poland – Libraries. Solidarity. Society. in Session 112 - Poster Sessions. 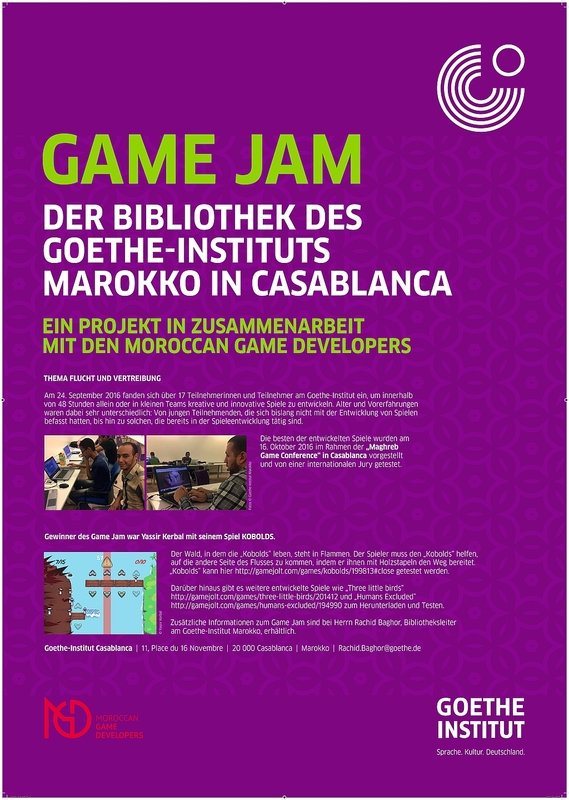 The poster informs about the Game Jam which the Goethe-Institut Marokko in Casablanca organized in cooperation with the „Moroccan Game Developers“ on the 24th and 25th of September 2016. Over 17 participants met at the Goethe-Institut to develop alone of in small teams creative and innovative games during 48 hours concerning the current topic “escape and expulsion”. The best of the developed games were presented during the “Maghreb Game Conference” in Casablanca on the 16th October 2016 and tested by an international jury. Winner of the game Jam was Yassir Kerbal with his game “Kobolds”. 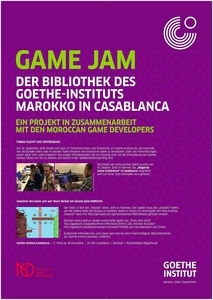 Das Poster informiert über den Game Jam, den das Goethe-Institut Marokko in Casablanca zusammen mit den "Moroccan Game Developers" am 24. und 25. September 2016 durchgeführt hat. Über 17 Teilnehmende trafen sich im Goethe-Institut, um allein oder in kleinen Teams während 48 Stunden kreative und innovative Spiele zu den aktuellen Themen "Flucht und Vertreibung" zu entwickeln. Die besten der entwickelten Spiele wurden am 16. Oktober 2016 während der "Maghreb Game Conference" präsentiert und von einer internationalen Jury getestet. Der Gewinner des Game Jam war Yassir Kerbal mit seinem Spiel "Kobolds".